Preferred format: This teaching activity is designed for small groups of students or as an overall class discussion. Student audience: This exercise is more suitable for students of later level marketing subjects or at masters level. Preferred format: For this exercise, students complete an online ‘marketing career quiz‘ and then discuss the findings in groups or in a class discussion. 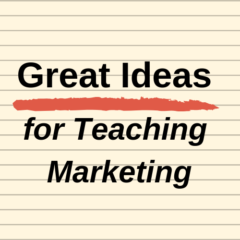 Student audience: This discussion exercise is suitable for students studying introductory marketing.